What is a local bitcoin wallet? When people search for local bitcoin wallets, they could actually mean different things. A local bitcoin wallet could mean the bitcoin wallet offered by the bitcoin exchange LocalBitcoins.com, or, it could mean a bitcoin wallet that's not web-based. LocalBitcoins.com is a bitcoin exchange where you can buy and sell bitcoins. Unlike other bitcoin exchanges such as Coinbase, Bitfinet, Bitstamp etc., LocalBitcoins.com is actually an OTC (over the counter) bitcoin exchange/marketplace, where people do peer-to-peer bitcoin trading. Many people find LocalBitcoins.com is very convenient because it has some nice features. For example, you might need to provide a government ID in order to open an account or trade bitcoins. Also, LocalBitcoins accept many more payment options than other bitcoin exchanges, including Paypal, credit card, gift card and even cash. With LocalBitcoins, you can even buy bitcoins in China using Alipay and WeChat. LocalBitcoins does offer a bitcoin wallet for its users to send and receive bitcoins. However, for the time being, it's bitcoin wallet is web-based. If you are looking for a mobile bitcoin wallet offered by LocalBitcoins, it still not available yet. Let's hope someday LocalBitcois can offer a mobile bitcoin wallet. Web-based Bitcoin wallets, such as Localbitcoins' wallet and other bitcoin wallets such as Coinbase, Blockchina.info etc., offer some advantages, including the convenience to access and use etc. However, the disadvantage of web-based wallets are also obvious: if the website is down, you won't be able to access your bitcoins. Also, since your bitcoin private key is usually saved on the web wallet's server, if the server is hacked, you might end of losing your bitcoins. To improve security, many people recommend so-called cold wallets, meaning that you store your bitcoins in a place that's normally not connected to the internet and thus cannot be easily hacked. When it comes to cold bitcoin wallets, the most simple (and inexpensive) solution is a paper wallet, meaning that you print out your bitcoin's address and its private key on a piece of paper and then save the paper in a secure place such as a safe. Bitcoin hardware wallet is another option for cold wallet. In this case, you need to buy a piece of hardware, which in most cases look like a USD drive. Then you can set up it as your bitcoin wallet. The hardware wallet is usually stored offline in a secure place. When you need to do some bitcoin transactions, you then plug it in a computer and use some software to do the transaction. 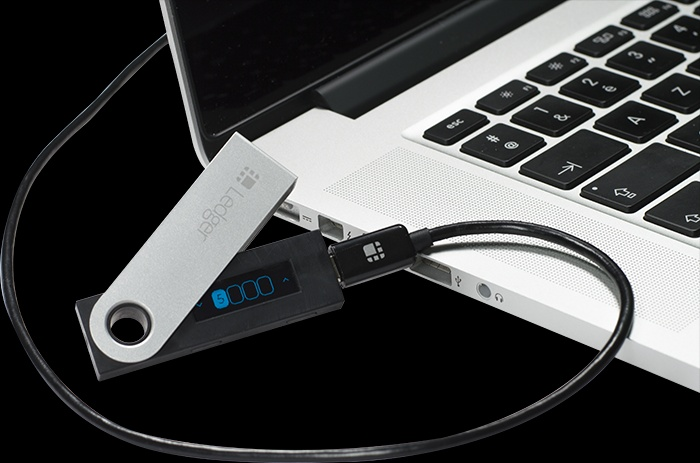 The most popular bitcoin hardware wallets include Trezor and ledger Nano. Cryptocurrencies are increasingly becoming a global phenomenon in the 21st century. This crash introduction will explain all you need to know about cryptocurrencies. A cryptocurrency is digital currency that is used to make any kind of payments of any value without incurring fees. A cryptocurrency runs on blockchain technology. Simply put, blockchains are decentralized ledgers just like any spreadsheet, that accept inputs from various parties. Details in these ledgers can only be changed only when there is a consensus among the group. This makes the transactions within the ledgers highly secure and it also means that third parties such as banks, are not required to approve the transactions. Blockchain is a hot topic right now and you can hear news about blockchain very often these days. Cyptocurrency units are generated from a process known as mining. This process involves the use of computers with high computational power that solve complex math problems to generate coins. The generated coins can then be bought from coin brokers, stored and spent through the use of cryptographic wallets. The applications and usage of cryptocurrecny and blockchain technology are quite promising and more uses are to be expected. For example, bonds, stocks and other financial assets transactions could eventually be made using this technology. The most common forms of cryptocurrencies include Bitcoin, Ethereum, Ripple and Litecoin. 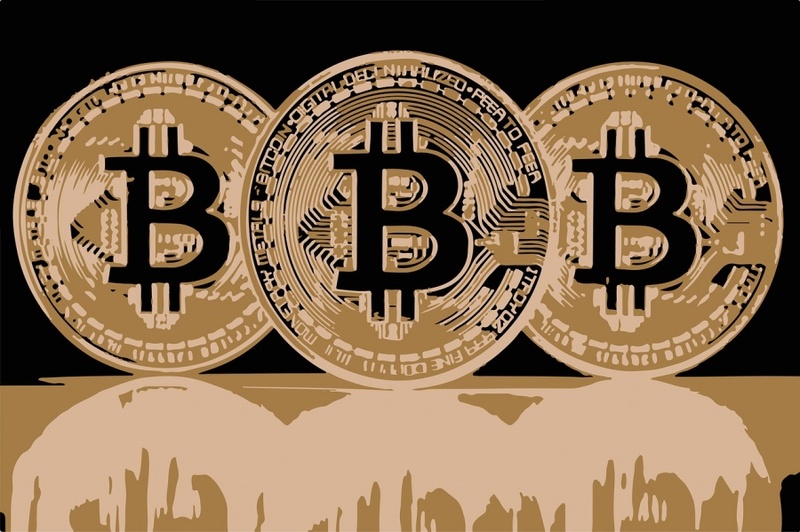 Bitcoin was the first cryptocurrency developed in 2009, and is the most commonly traded. As of July 2017, it has a market capitalization of about $45 billion. Ethereum was developed in 2015. It is the second most popular of the cryptocurrencies. It has a market capitalization of around $18 billion as of July 2017. Ripple was established in 2012. However this cryptocurrency can be used in tracking different kinds of transactions besides cryptocurrency. It has a market capitalization of around $6.3 billion and has been used by banks such as Santander and UBS. Finally, Litecoin is a cryptocurrency that has been linked to new innovations including fast payments and transactions. It has a market capitalization of $2.1 billion. There are two major ways of acquiring a cryptocurrency, one is purchasing a highly expensive, and energy-consuming supercomputer and use it to mine a particular cryptocurrency. This I do not personally recommend for obvious reasons. The other alternative is to buy the cryptocurrency itself. This can be done from a number of user-friendly websites for example Coinbase and Poloneix just to mention a few. But I highly recommend going over some reviews before making a choice. These are some of the steps one has to go through before buying a cryptocurrency. First, set up a cryptocurrency wallet. This is where you store your cryptocurrency. This can be done by installing a mobile app or registering for a wallet online. Second, securing your account. Many online wallets come with a series of security measures that you take to ensure the security of your cryptocurrency. You have to note some important aspects such as your wallet ID and other security measures. After securing your wallet, the next step is to find a broker. You can choose your appropriate broker from online platforms where you send cash to the broker and in turn you receive some cryptocurrency in your wallet. The fourth step is to buy. Finally the fifth step is to sell or spend. You can use the same broker to sell your cryptocurrency or decide to purchase anything you want as long as they accept cryptocurrencies as form of payment. 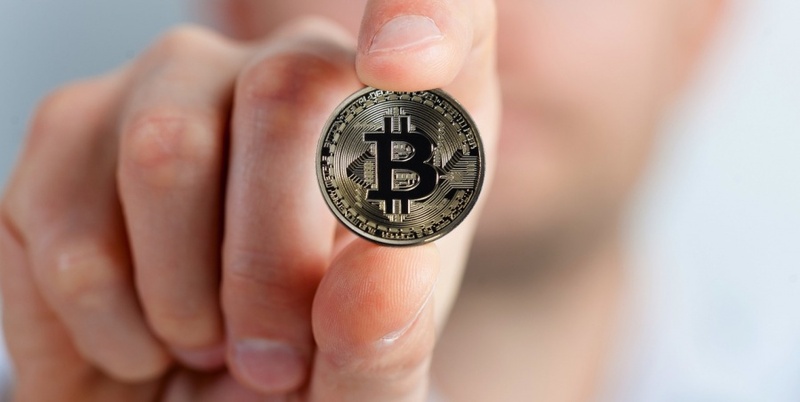 Once you have enough knowledge about cryptocurrency, you might consider using it for online purchase or use it for investment. Recently Initial Coin Offering (ICO) has become a hot topic and you might have heard about this term and you can find many new startups from ICO lists. Make sure you understand those companies very well before buying their tokens. Cryptocurrency is a revolutionary. It has also made many people rich. However, spending time to understand it is the very important first step. VPN, or Virtual Private Network, is no longer a term that people don’t quite understand. As a matter of fact, many people have started using a VPN on a regular basis. A VPN can be used for different purposes. For example, some people use VPN to increase online security; Some people use VPN to bypass content blocking; Some people use VPN to stay anonymous online. For online marketers or SEO professionals, VPN can be used for additional purposes. To help you better understand why VPN can help with your online marketing or SEO projects, let me first point out the concept of geo-targeting. Let’s say you are visiting Google from the United States and you search for a term, the results Google shows you might be different if you do the same search in another country, for example, Singapore. Also, if you visit Netflix from the UK, the contents you see will be different from what you see if you are in the United States. This is what has been called as geo-targeting. How geo-targeting works? Well, each computer connected to the Internet has an IP address, which can not long identify this computer but can also reveal location of this computer. When you visit a website, your IP address will be shown to that site. Based on your IP address, that website can figure out your location, and then if can show contents that target your current location. Geo-targeting not only works for websites, but also for advertising. 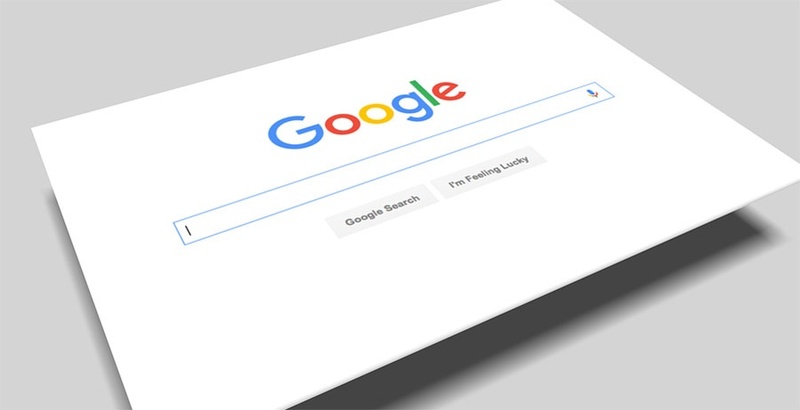 For example, querying Google with the same keyword might result in different ads showing up when the search was initiated from different countries. If you have used Adwords before, you must be familiar with the Adwords setting where you can specify to which countries your ads should be showing. For online marketers and SEO professionals, one problem we are facing is to efficiently take geo-targeting into consideration when doing our efforts. For example, if you are working from your office in New York, how do you know whether your ads show up correctly to people visiting Google or your target websites from Atlanta? Well, to solve this problem, you can use a VPN to help. On benefit of using a VPN is that you can appears to be on a different IP address when you connect to the Internet. Most VPN providers offer VPN servers in different locations. Many of them have servers in hundreds of places around the globe. You can connect to a VPN server in your targeted location to get an IP address for that location. As a result, when you go online, you will see what Internet users in that location normally see. Server locations. This could be the most important thing that you consider. Make sure the VPN provider covers a good range of locations that include the locations that you are interested in targeting. VPN Prices. Most VPN services offer reasonable prices and it's not difficult to find some VPNs that are really cheap. The normal price range is between $2 to $10 per month. Also, many providers offer free trials, which allows you to test their services without spending a penny. Multi-logins. One VPN feature that can be easily ignored is the restriction on multi-logins, or simultaneous connections. With a VPN account, usually you can only connect to it at the same time from a limited number of devices. Some VPN services limit this number to 2, while others allows up to 5. If you need to connect to VPN from multiple devices at the same time, make sure you know what this limit is from your potential VPN provider. Once you have signed up for a VPN service, you can use it to bypass geo-targeting and see what people in other locations will see. On top of that, you can also enjoy better online security. Therefore, you should definitely give VPN a try! One challenge for many webmasters and SEO specialists is to get a newly created page (such as a new blog post) indexed by Google as fast as possible. We want fast Google indexing because we hope to get organic traffic from Google as fast as possible. However, often times you have to wait quite a long time to see your new page indexed by Google. It could be a few days or even a few weeks. Is there a faster way to get a new page indexed by Google? The answer is yes. Let me show you how I get newly created web pages indexed by Google within 1 minute. To use this technique, first of all, you need to have a Google Webmaster account. If you don’t have one yet, you can sign up from here. Once you’ve registered a Google Webmaster account, you need to sign in to Search Console and then click on the “Add A Property” button to add your website to the Search Console. This step requires some verification but let me skip the details here. Once you’re in the Sitemaps section, just click on the “Add/Test Sitemap” button on the upper right corner and tell Google where your sitemap is located. 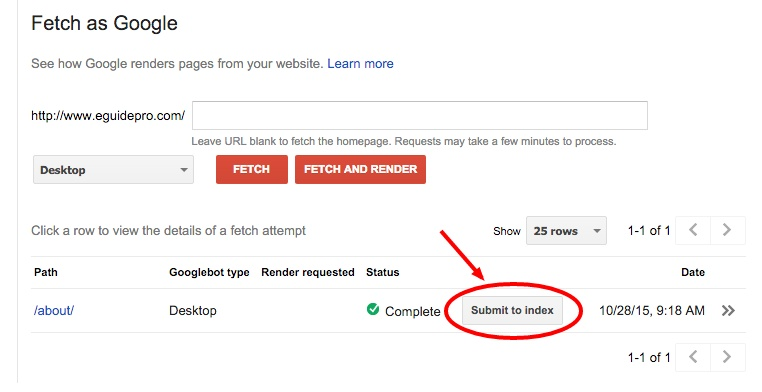 Using sitemap can help you get newly created pages indexed by Google faster and automatically. However, this is NOT the real trick I’m talking about. Now here’s the real trick. 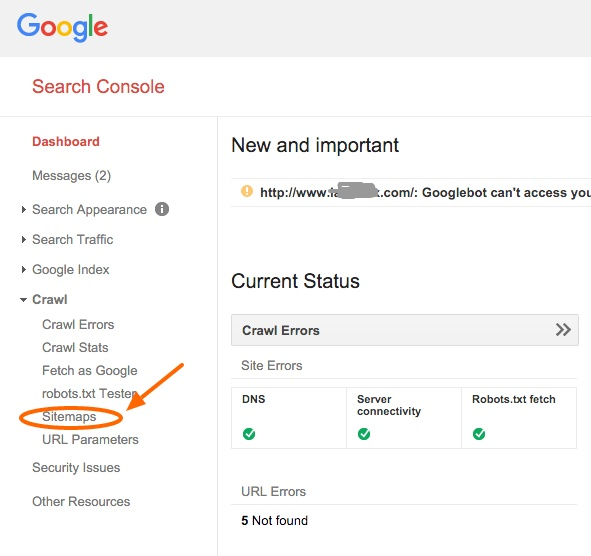 In the Google Search Console, under “Crawl”, there’s a link titled “Fetch as Google” (see image below). That’s the magic tool to get your new page indexed by Google super-fast. Once you’ve clicked the “Fetch as Google” link under the “Crawl” section, you will see a form where you are asked to fill in a URL. Just paste the URL of your newly created page there and click on the “Fetch” button to its right. After that, you will see the new path you just entered shows up below. Along with the path, you will see a “Submit to index” button. That’s the magic button to get our newly created page indexed by Google within 1 minute (see image below). Now click on that button. 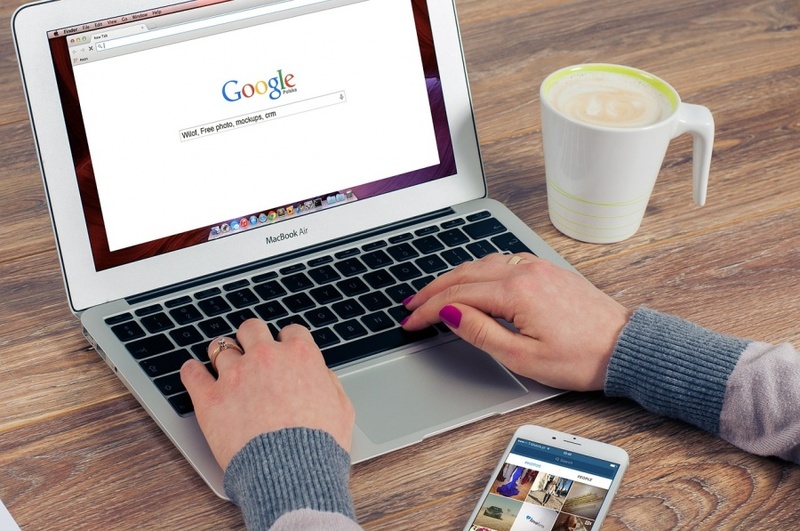 At this point, Google will start indexing your new page! You can then test whether this new page has been indexed by Google by pasting the full URL into Google’s search box. If the new page shows up as the first result, then it’s done! 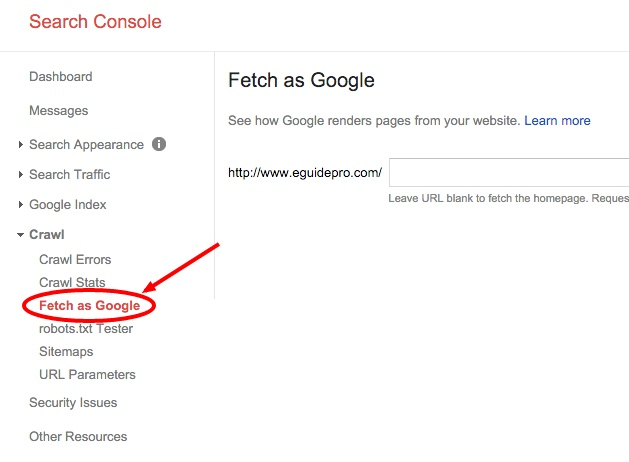 Based on my experience, I were able to get newly created pages indexed by Google within a few seconds (yes, seconds) after using the the “Fetch as Google” tool. Since my experience with this technique has been limited to my own site, I can’t guarantee everybody will see the same result as fast as I got. However, I think it’s still worth knowing about this trick. Using this method is definitely better than just waiting for Google to pick up the new page. Not only can you use this trick to add new pages to Google, you can only use it to update existing pages. For example, you might have done some tweaking on a page and you want the changes indexed by Google as soon as possible, you can use this trick as well. Just feed the URL of this page to the “Fetch as Google” tool and let Google index the newly updated content!